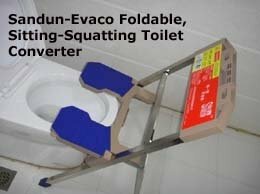 With an Evaco toilet squatting platform, you can 'convert' your sitting toilet into a squatting one. 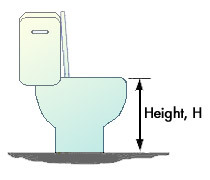 1) No need for any changes to your toilet or plumbing; fits all standard sitting toilets up to 41 cm or 16.2 inches in height (seat cover lifted up, as shown in this diagram) and 42 cm or 16.5 inches in width (the toilet bowl itself). 6) A one-time investment that will allow you to enjoy all the health benefits of squatting for a lifetime. "You may want to know that the first squatting platform you sold me in Penang is holding up well in the Asian climate after almost 3 years, with no stains or rust, and no perceptible wear and tear. Good product!" I am thankful that there is actually such a simple solution to building health through proper and total elimination of waste. Serious hemorrhoids plagued my health after I delivered my eldest son. 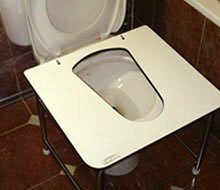 I believe that if I had known about the Evaco toilet squatting platform, my problems would have been solved much earlier. Want to see a modern tragedy? Go look at your toilet seat. 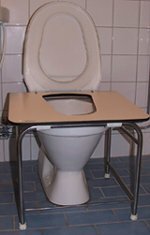 The worst thing for long-term health happens while sitting instead of squatting in the bathroom. Why do so many of us suffer from constipation, heartburn, low back pain, hernias, hemorroids, colon cancers, and overeating due to misabsorption of nutrients? The answer is our ridiculous insistence upon 'civility' on the toilet, which stagnates our natural 'sewer system'. I grew up in a Muslim society, where squatting toilets are quite common. However, a few years ago, I moved to a Scandinavian country. I found that using a chair pan is not so comfortable for me. As a 'solution', I used to squat on the pan's seat. 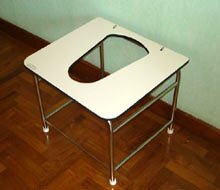 However, recently I moved to a new apartment and decided to buy the Evaco Squat Platform (shown fitted to my toilet). Many words could be said about benefits of squatting for defecation, but the best is your own experience. Just try it for a while, and your body will tell you more than what a thousand words can! I have always been told that the proper way to eliminate is by squatting. This is the reason why our ancestors did not developed the numerous diseases that plague our body (via the colon) today. The Evaco Squat Platform measures 51 cm x 46 cm x 43 cm (height), ie: 20 inches x 18 inches x 17 inches (height). It is built with quality materials. The platform is made of 12 mm thick (0.5 inches) biege color high pressure laminate, which is extremely strong and water, chemical and scratch-resistant. 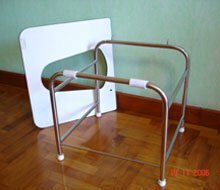 The frame and legs are made of 19 mm (0.8 inches) diameter stainless steel tubing. Bottomline: the Evaco toilet squatting platform is built to last and will enable you to adopt the natural squatting position safely and comfortably for many years to come. 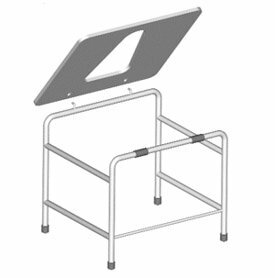 Have Questions about The Evaco Toilet Squatting Platform? If you have any questions about the Evaco toilet squatting platform, I would be happy to answer them for you. You can write to me via the form below.